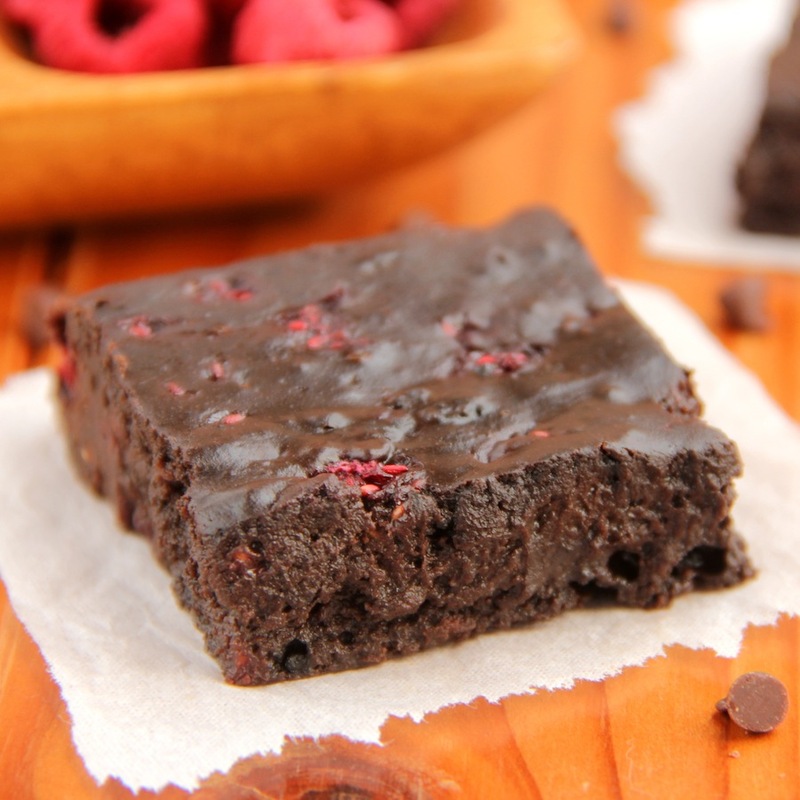 An easy recipe for decadent brownies studded with chunks of raspberries. 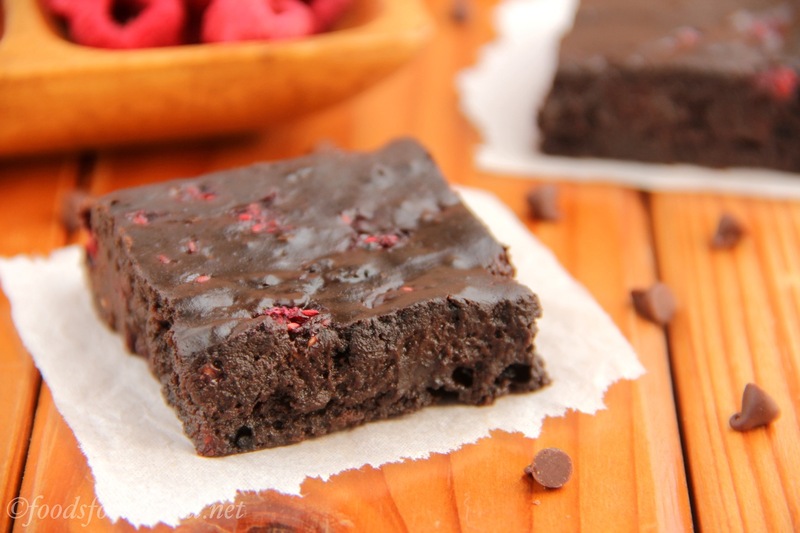 You’ll never believe these are actually healthy and secretly skinny! Saturday afternoon, I carefully nestled two trays of homemade sweets onto my passenger seat, praying with all of my fingers crossed that they’d survive my 45-minute drive. I slid behind the wheel and clutched it with white knuckles as I sped down the highway, belting out pop songs along with the radio at the top of my lungs to calm my nerves. As I eventually eased down the off-ramp and navigated through city streets, I took a few deep yoga breaths before pulling to a stop near the end of a cul-de-sac. Seven of us food bloggers live within a short 1-hour radius in the suburbs of Sacramento, and Dorothy of Crazy for Crust invited everyone over, along with their husbands and kids, for an afternoon of real-life socialization, away from the confines of our computer screens. We spent most of the time sprawled around her comfy couch and chairs, grazing on various potluck goodies and trading stories of baking and photography, blueberries and sprinkles, planter boxes and fruit trees—all topics we type and talk about on a daily basis! Amy of Very Culinary immediately greeted me as I maneuvered past the kiddos and into the kitchen. Full of positive energy that permeated throughout the room, she quickly made me feel at home, despite being a complete stranger! Amy develops tasty dishes for her blog—including this incredibly creative milk chocolate soup with pound cake croutons—as well as running another sugar-laden site called Cookie Hound. That’s right; it’s a food photography website entirely dedicated to cookies! Go check it out (the link opens in a new window, so you won’t lose your spot here), and I guarantee you’ll find at least 27 different ones you’ll want to make. And if you’re a food blogger, it’s free to sign up and submit your shots, just like FoodGawker or Tastespotting! I next met Hayley of The Domestic Rebel, the cutest, quirkiest, most vibrant and comedic girl there. She bakes amazing treats, like these Andes thin mint cupcakes that made me positively weak at the knees. Just look at those indulgent swirls of fudgy chocolate frosting! Most of her decadent desserts are secretly simple and fuss-free, but they still look gorgeous and impressive. We quickly bonded as the only two bloggers without husbands and kids, laughing about many of the oddball guys our age in the dating scene. Then Glory of Glorious Treats entertained us with a sneak peek at her new cookbook. 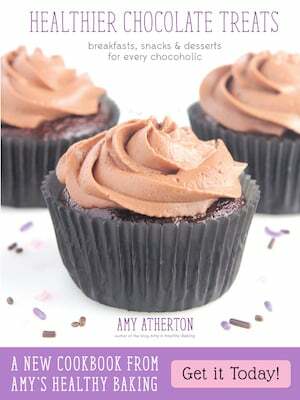 She filled the pages with decadent recipes of layered desserts—such a cute concept! I immediately ordered a copy the next day, and I’m planning on attending her book launch party this Friday too. If you’re in Northern California, you don’t want to miss it! See her Facebook page invitation for all the details. Glory also makes incredibly stunning gourmet treats for her blog, and she was actually the first person to ever create an ombre swirl cake—wow! Heather of French Press actually lives in the same town as Glory, and she captivated us with stories of her chickens, which provide her family with fresh eggs daily. Slightly green with envy, the rest of us secretly wanted to buy our own chicks after that; we spend a fortune on our eggs at the grocery store! She also bakes fun treats like these chocolate chip cookie dough custard donuts, and I hoped and prayed that she’d bring a batch to the party. Cookie dough inside of donuts topped with Nutella? Brilliant! Trish of Mom on Timeout kept us in stitches all afternoon with her hilarious personality. She shared snippets of her adventures as the DIY Queen, including how she planted a mini fruit orchard in her backyard—cherries, citrus, and more. I nearly offered to pick everything for her and accept a few pints as payment! Trish baked these colorful key lime gooey bars to the party, but the kids snagged them all before I could reach the counter. Take one look at them, and you’ll see why! 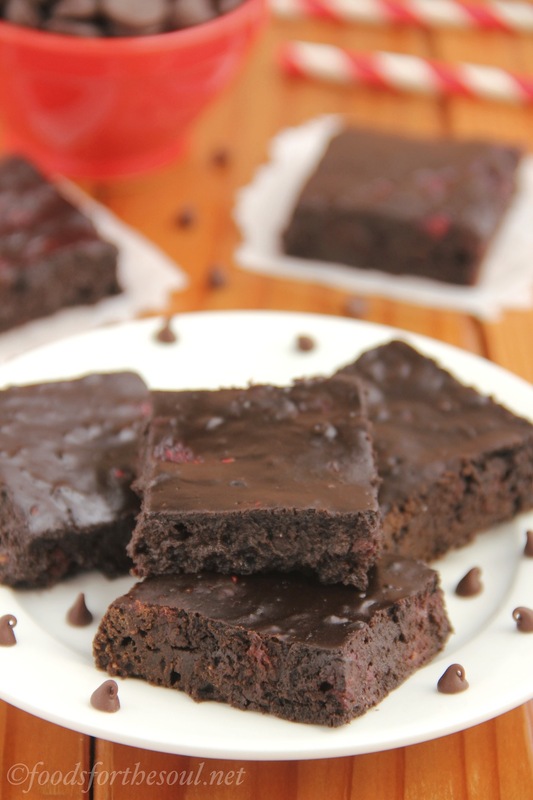 For my little contribution to the buffet table, I baked these Fudgy Dark Chocolate Raspberry Brownies. 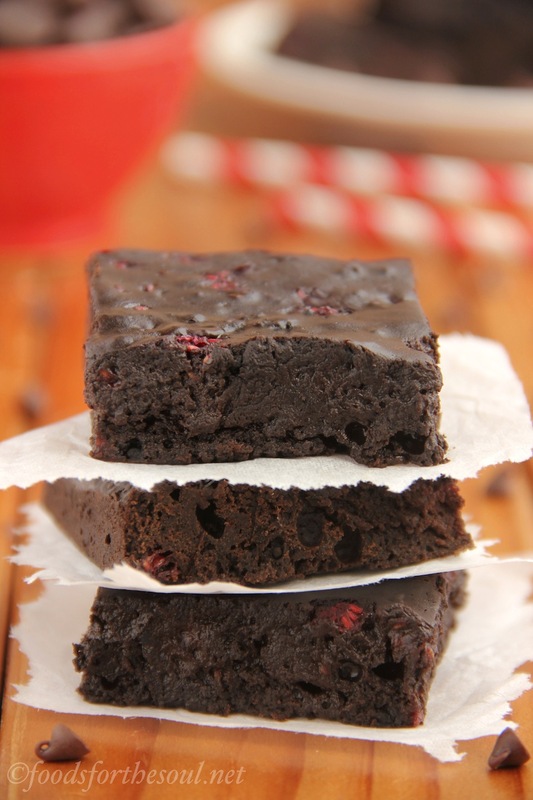 Bright and tangy bits of fruit fill each decadent square, and their moist, gooey texture is absolutely irresistible. Despite their rich taste, they’re still secretly skinny, so you feel absolutely no guilt when you steal seconds and thirds! I based these brownies off of my popular recipe, and they’re super simple to make—basically as easy as a box mix! Just whisk together the dry ingredients in one bowl and the wet in another; stir them together, fold in the raspberries, and bake. No butter or chocolate to melt, and very few dishes to clean! I made one minor tweak to my original recipe: I mixed in both regular and Hershey’s Special Dark cocoa powder. 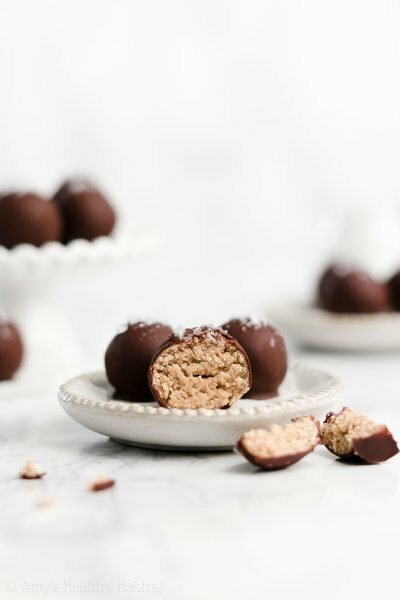 The latter creates the most luxurious dark chocolate flavor without adding lots of excess fat and calories from melted unsweetened chocolate, and it gives them a darker color too. See how they look almost brownish-black in the photos? That’s all from the Hershey’s Special Dark cocoa powder! (It’s sometimes called “Dutched” cocoa powder too.) 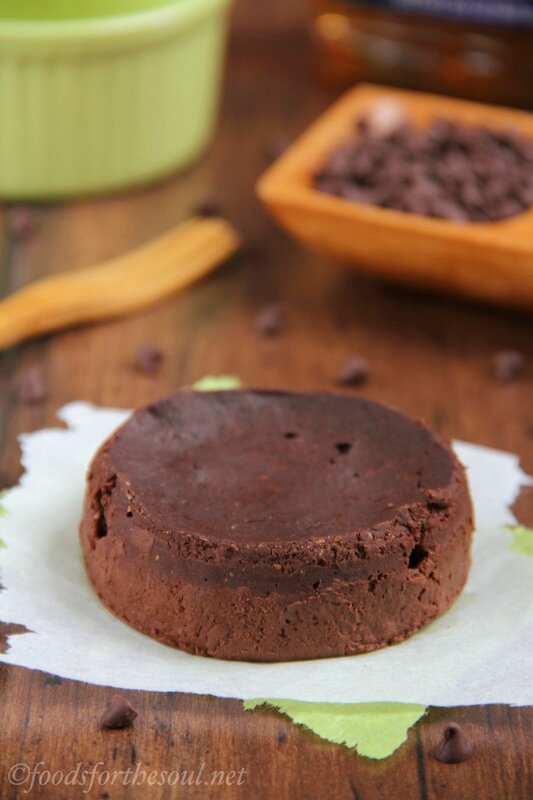 If you don’t have any or prefer a slightly milkier taste, use entirely regular unsweetened cocoa powder instead. I decorated the brownies for the party a little differently. Since I knew there’d be plenty of sweet treats, I cut them into 25 smaller squares (instead of the 16 for these photos) and pressed a single raspberry in the center of each. 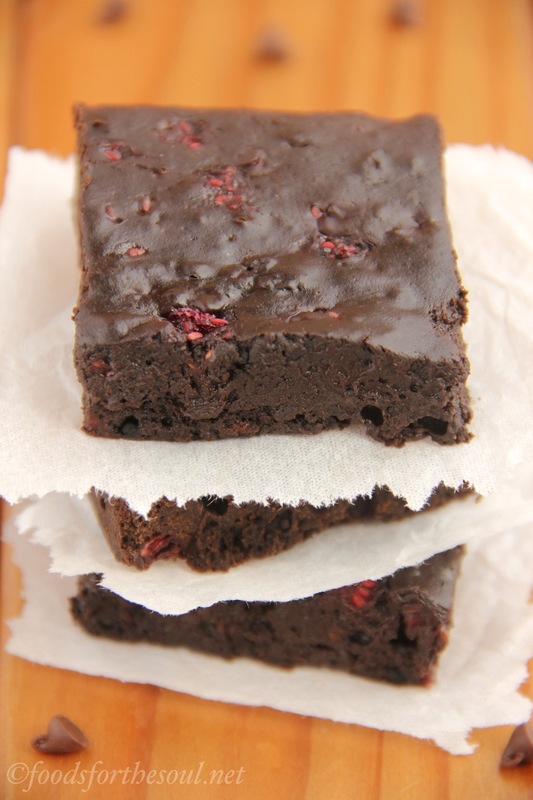 They looked adorable, but I wanted to make sure the batch of larger brownies contained raspberry in every bite—not just the one in the center!—so I diced the fruit before folding it in. Feel free to use whichever method you prefer. 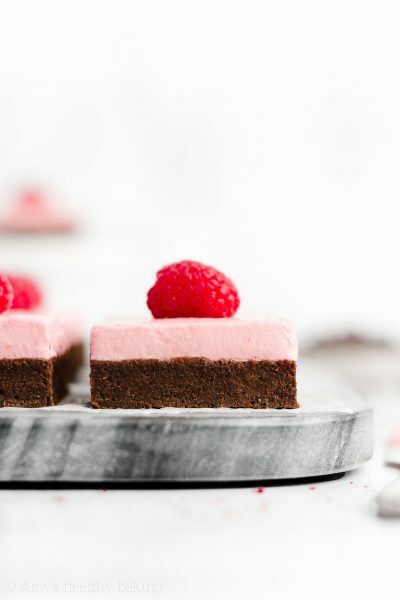 And I actually used frozen unsweetened raspberries so you can make these all year round, not just during berry season in the summer! 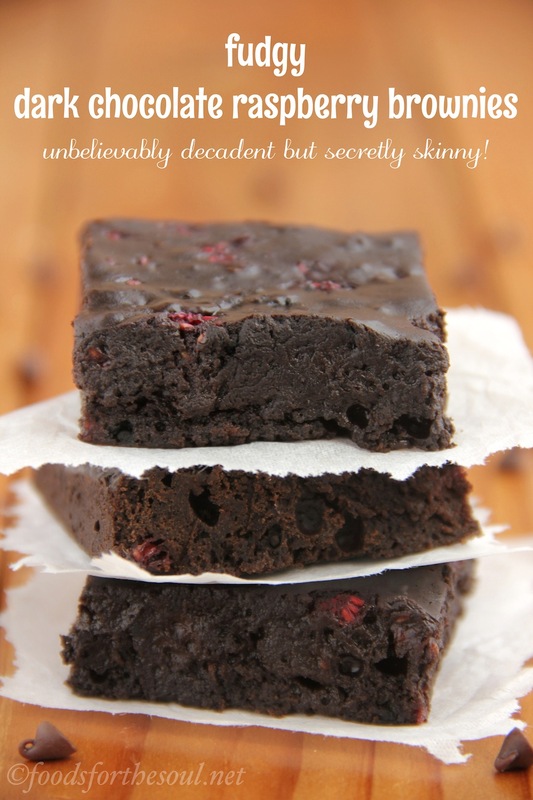 Want to know the secret to creating ultra moist, fudgy brownies? Bake them low and slow. If you set the oven at a higher temperature, the edges burn while the center stays raw. (Trust me, I ruined quite a few batches while developing this recipe!) You’ll bake these at 300°F for 24-28 minutes. The earlier time ensures that all of the brownies turn out super fudgy, especially the ones in the center, while the latter results in firmer, barely gooey brownies. The center will still look soft, glossy, and underdone when you pull the pan out of the oven. That’s good! It will continue to cook through as the brownies sit on the counter. 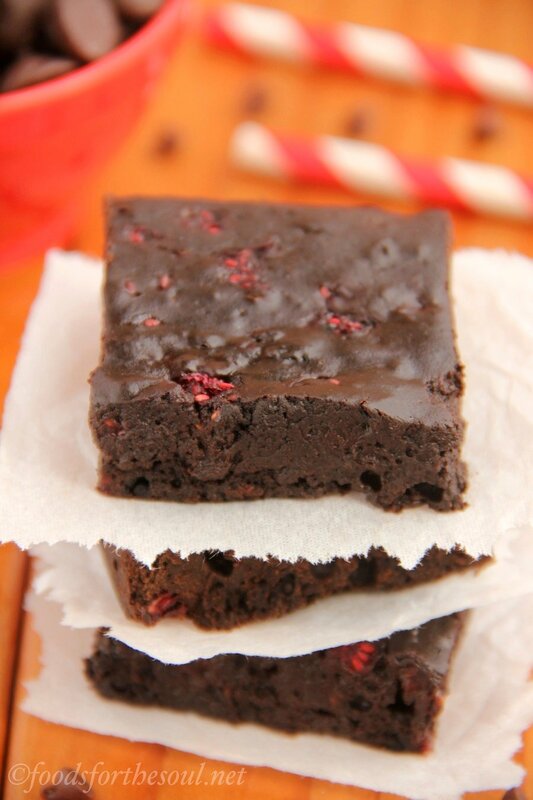 Let them cool all the way to room temperature in the pan before slicing into squares. I know it’s really hard—practically impossible with that tempting smell of chocolate wafting through the house!—so I usually bake mine just before bedtime and let them sit overnight. 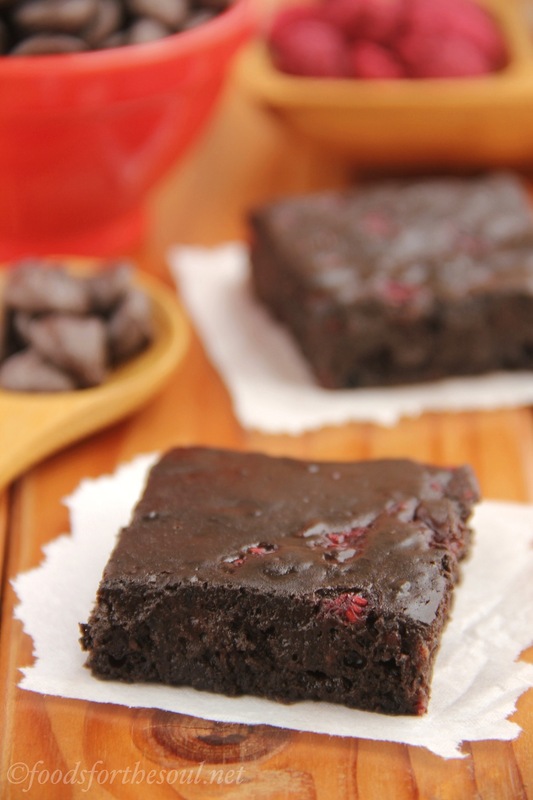 Nothing beats the taste of fresh brownies at breakfast! 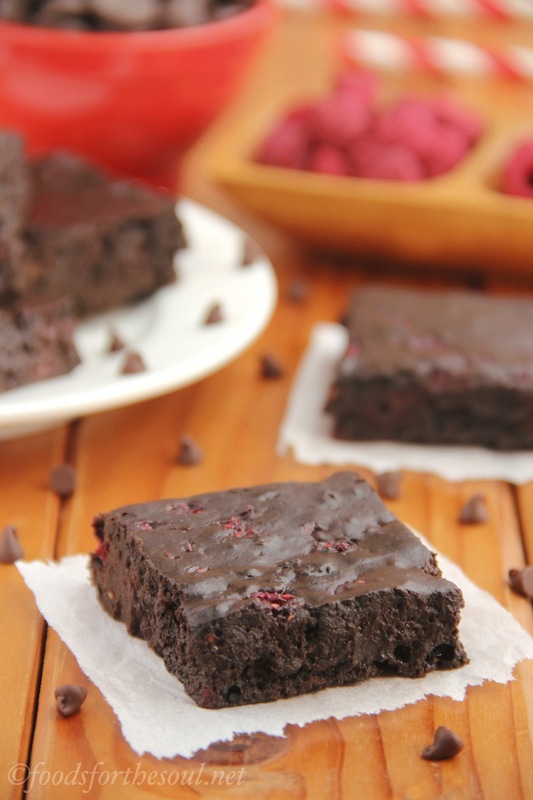 From the very first bite to the final crumb, you’ll love these Fudgy Dark Chocolate Raspberry Brownies! 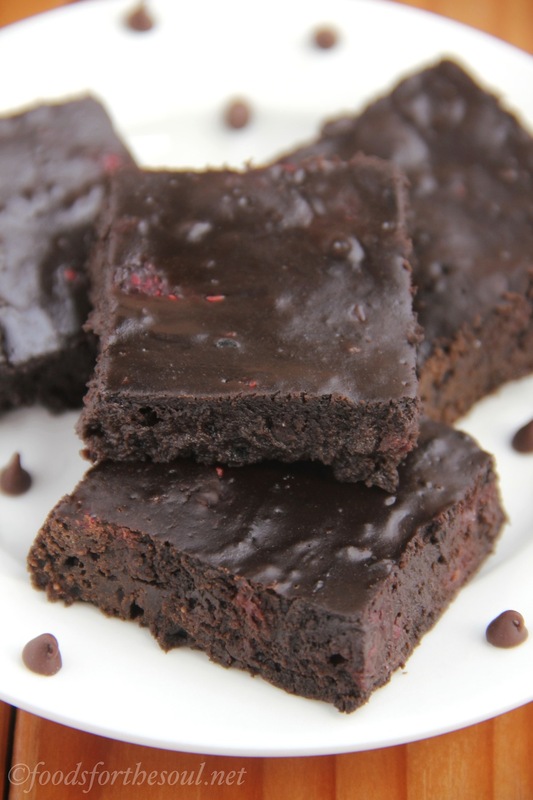 Decadent flavor fills every moist mouthful, punctuated by the sweet and tangy morsels of fruit. 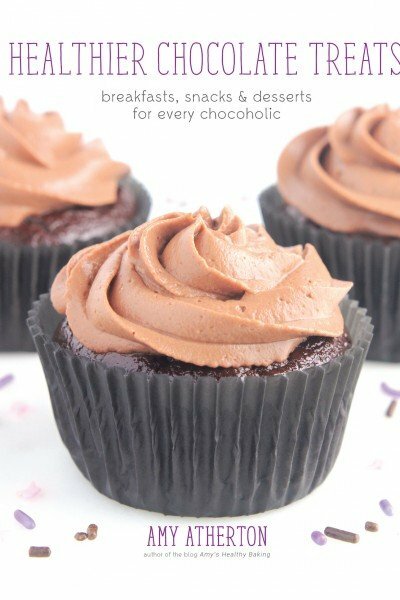 They’re a chocoholic’s dream! 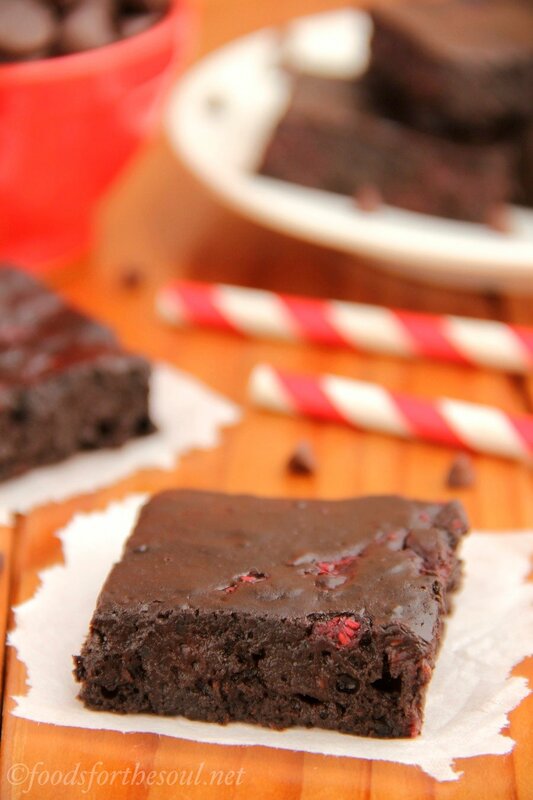 These decadent brownies are so moist and fudgy, and the little bits of raspberry add a fun fruity flavor! Store any leftovers in an airtight container in between layers of wax paper for up to a week. 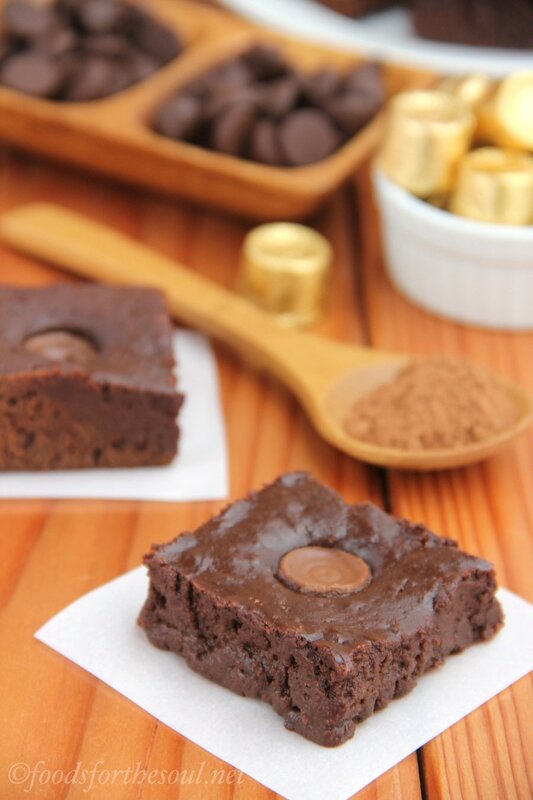 In a medium bowl, whisk together the flour, cocoa powders, baking powder, and salt. In a separate bowl, whisk together the oil, eggs, and vanilla extract. Stir in the sugar. Mix in the yogurt and milk, stirring until smooth and no large clumps remain. Add in the cocoa mixture, and stir until just incorporated. Gently fold in the raspberries. Spread the batter into the prepared pan, and bake at 300°F for 24-28 minutes (closer to 24 for fudgier, gooier brownies; closer to 28 for firmer brownies). Cool completely to room temperature in the pan, and allow the brownies to set for an additional hour before slicing into squares. 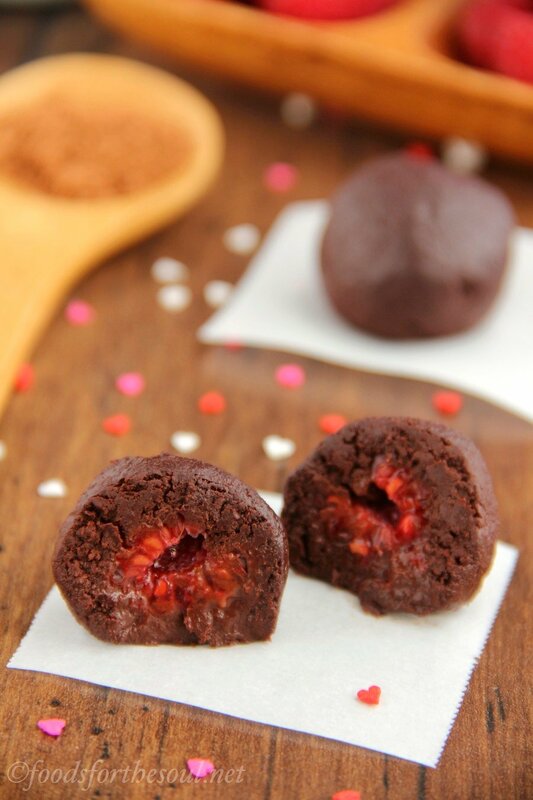 Notes: You may use entirely regular or Dutched cocoa powder if you prefer; just make sure the total amount equals ¾ cup. 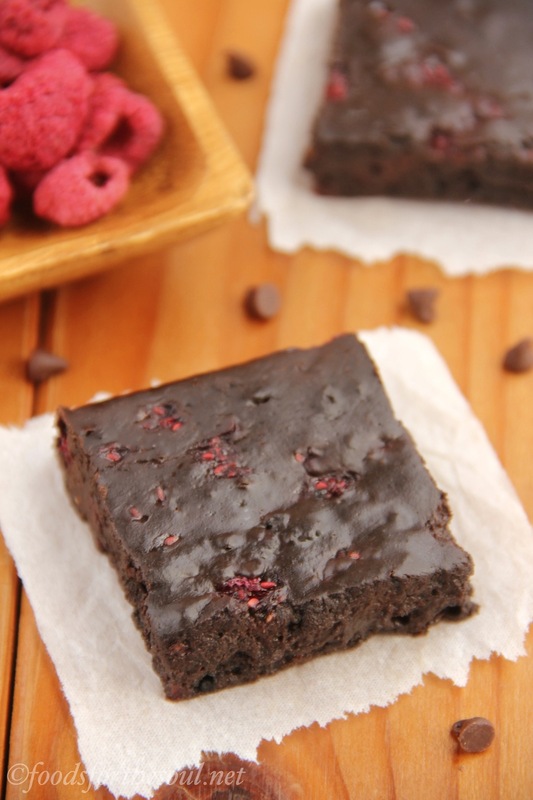 Avoid substituting frozen sweetened raspberries; they contain a lot of added sugar. I have not tried fresh raspberries, but they will probably work. Fresh raspberries are more fragile than frozen, so be very gentle when folding them into the batter. To prepare the brownies as I did here, press 25 raspberries into the brownie batter after spreading it into the pan, and bake as directed above. After cooling, slice them into 25 squares instead of 16. WHat do you think, what kind of changes do I need to bake it whit whole wheat flour? Or with oat? You wouldn’t need to make any changes if baking with whole wheat flour Piroska! I haven’t tried these with oat flour before, so I can’t completely vouch for that, but it should probably work too. I hope you enjoy the brownies! hi, just made them and can’t wait until they are ready to eat. 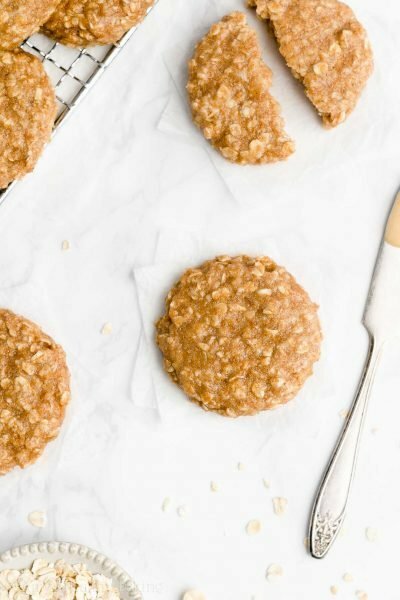 Is it possible to make them with almond flour and brown sugar to make them even more healthier??? Yes, those substitutions should work! I hope you enjoyed the brownies! Firstly, thank you so much for this recipe! I can’t wait to try it. I did want to know, though– can you substitute whole wheat flour for the regular flour and Splenda for the sugar? If so, would the measurements change at all? Whole wheat flour will work just fine Marie! If you use granulated Splenda that’s a cup-for-cup replacement for sugar, that should work as well. Both measurements will remain the same. I hope you enjoy the brownies Marie! It sounds as if you’d like to make these brownies clean eating friendly. If that’s true, then I already did that for you! 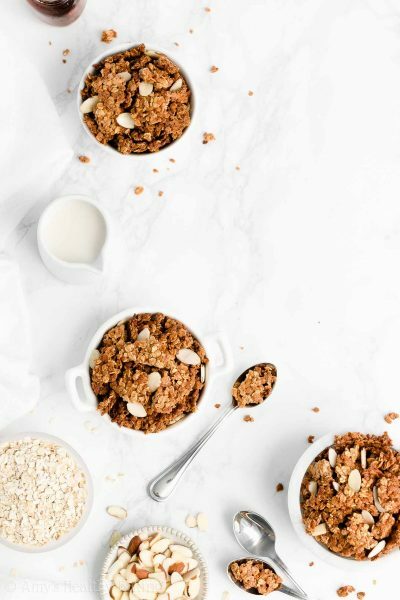 🙂 This is my updated clean-eating version of this exact recipe, so I think that will be exactly what you’re looking for. I hope you enjoy the brownies Celina!